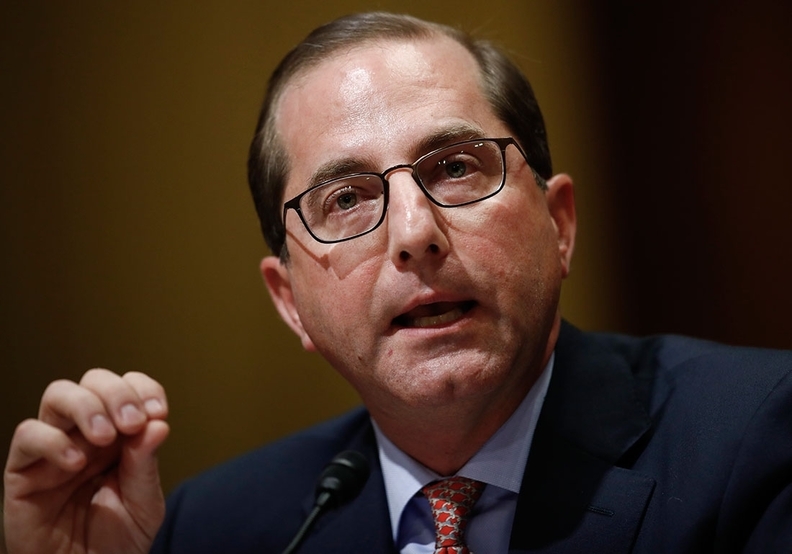 HHS Secretary Alex Azar on Thursday gingerly weighed in on Idaho's efforts to reshape its individual market and allow insurers to sell plans that flout Affordable Care Act coverage rules. Testifying before the Senate Finance Committee, Azar did not lay out any specific steps to address Gov. Butch Otter's goal of allowing insurers to offer plans that fail to comply with Affordable Care Act requirements as long as they also offer ACA-compliant plans. However, Azar promised to measure any waiver submitted by the state against "the standards of the law." In his budget defense before the Senate Finance Committee, Azar refused to lay out an immediate plan of action against Idaho's proposal for "state-based plans" that don't comply with some ACA requirements as long as the insurer offers ACA-compliant plans too. However, Azar promised to measure any waiver submitted by the state against "the standards of the law." "Idaho has to decide its own policy under its laws," Azar told the committee's ranking Democrat, Sen. Ron Wyden of Oregon, who raised the issue. "Anything that comes to us, I will work with you and be transparent, but I don't want to be involved, before there is a controversy, at the state level." Leading congressional Democrats warned HHS weeks ago they are on the alert for the Trump administration's response to Idaho's move away from the ACA. The state's effort began at the start of 2018, just after the repeal of the ACA's individual mandate, when GOP Gov. Butch Otter directed his insurance commissioner via executive order to come up with "creative" ways to expand options on the state exchanges. The insurance commissioner then gave insurers permission to offer plans that don't comply with the ACA on the individual market. Early this week, Blue Cross of Idaho responded by introducing five insurance plans that would cost up to 50% less than those available now on the exchanges. While they cover many of the ACA's essential health benefits, none of these plans cover pediatric dental or vision care and one lacks maternal health coverage. They also impose $1 million annual coverage limits. GOP Sen. Mike Crapo, Idaho's senior senator who is also in the running to serve as the next Finance Committee chair or ranking member once Sen. Orrin Hatch (R-Utah) retires from the Senate, fiercely defended his state's move and gave Azar a warning of his own. Idaho is trying to give people policy options while not keeping people from ACA-compliant plans if they want them, Crapo said. "The idea of choking it out right at the beginning is one I resist," Crapo said. Crapo also warned Azar that his state may soon apply for "a waiver or two with respect to some aspects of federal law" and that he hoped the secretary would help states that want "flexibility from the federal government" to come up with creative plans for their individual markets. But Democrats pushed back. Wyden noted that Idaho went ahead with its new policy without a waiver. "This is Idaho saying, 'We're going to do this,'?" Wyden said. "But there's a federal law, something I've fought very hard for: airtight protections that are loophole-free for those who have pre-existing conditions." And Delaware Democratic Sen. Tom Carper echoed Wyden's concern that the Trump administration will open the floodgates for a market of insurance plans with very little value. "People can buy cheap insurance, and it's not worth the paper it's written on," Carper said. Legal experts from the right and left agree that Idaho's move breaks with current law and that a state cannot exempt an insurer from federal statute.